We’d love your help. Let us know what’s wrong with this preview of The Lost City of Oz by Ben Hammott. They enter the trap filled city to realize the dangers they had faced so far on the journey, were just a taster for those they were about to encounter. Inside the city lurks danger and a secret those guarding it will kill to protect. Survival will not be easy: escape almost impossible. To ask other readers questions about The Lost City of Oz, please sign up. What an incredibly fantastic story! History and the present intertwine in this ripping yarn of adventure and adversity deep in the Amazon jungle. Ben Hammott has crafted an ingenious tale full of great characters, all of whom are likeable but not necessarily always good people. The story hooks readers with the mysteries of the past and legends of treasure, and then connects to them through the descendants of the original adventurers. From that point on, this pair of books takes the reader on a jo What an incredibly fantastic story! From that point on, this pair of books takes the reader on a journey through rough terrain, down treacherous rivers, and territory inhabited by previously unknown tribes. I thoroughly enjoyed this Indiana Jones style adventure. It had plenty of heart-in-your-throat moments, a tantalising amount of mystery and intrigue, and some really engaging characters and dialogue to keep the story moving. 5 stars for this great book that would suit any reader from YA upwards. I thoroughly enjoyed this book. In fact although I had to suspend my believes a lot more during this book I got a huge kick out of it . 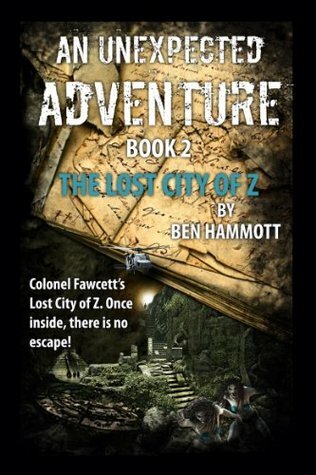 The story is set in the Amazon jungle and revolves around the attempts of an expedition to find out what happened to Colonel Fawcett who entered the jungle in 1925 to search for a rumored lost city but was never seen or heard from again. An exciting adventure with interesting characters and plot. It seems the author has researched the true story to come up with a possible scenario as to the fate of the Victorian explorer. The story is in two parts, book one and two.